Click here to get a major discount on The Faerie Guardian audiobook if you already own the (free) ebook. Or get a 30-day free Audible trial if you don’t already have an account, and get The Faerie Guardian audiobook for free! Or go to Amazon’s Audible Matchmaker and see all available audiobooks for ebooks you’ve already purchased. **If you’re outside the US, this amount might be slightly higher if it includes VAT. 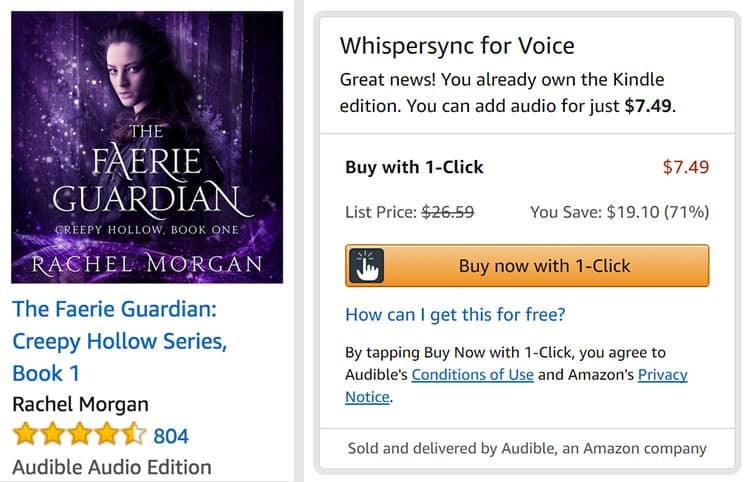 So, if you already own The Faerie Guardian, you can CLICK HERE to get the Audible audiobook for just $7.49 instead of $26.59! Or, if you don’t yet have an Audible account, you can sign up for a 30-day FREE TRIAL and get your first audiobook for FREE!